Primary open angle glaucoma is a heterogeneous group of optic neuropathies that results in optic nerve degeneration and a loss of retinal ganglion cells (RGCs) ultimately causing blindness if allowed to progress. Elevation of intraocular pressure (IOP) is the most attributable risk factor for developing glaucoma and lowering of IOP is currently the only available therapy. However, despite lowering IOP, neurodegenerative effects persist in some patients. Hence, it would be beneficial to develop approaches to promote neuroprotection of RGCs in addition to IOP lowering therapies. The endothelin system is a key target for intervention against glaucomatous neurodegeneration. The endothelin family of peptides and receptors, particularly endothelin-1 (ET-1) and endothelin B (ETB) receptor, has been shown to have neurodegenerative roles in glaucoma. 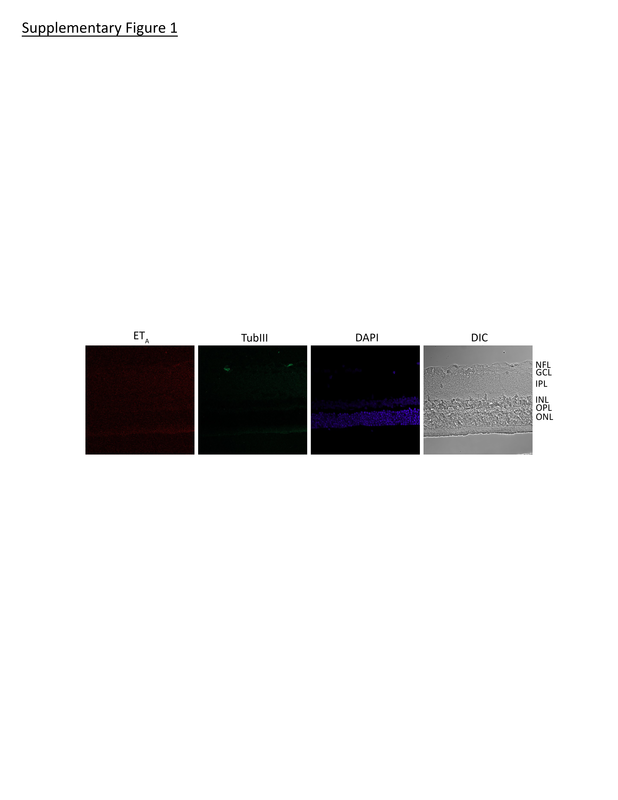 The purpose of this study was to examine changes in endothelin A (ETA) receptor protein expression in the retinas of adult male Brown Norway rats following IOP elevation by the Morrison’s model of ocular hypertension and the impact of ETA receptor overexpression on RGC viability in vitro. IOP elevation was carried out in one eye of Brown Norway rats by injection of hypertonic saline through episcleral veins. After 2 weeks of IOP elevation, immunohistochemical analysis of retinal sections from rat eyes showed an increasing trend in immunostaining for ETA receptors in multiple retinal layers including the inner plexiform layer, ganglion cell layer and outer plexiform layer. Following 4 weeks of IOP elevation, a significant increase in immunostaining for ETA receptor expression was found in the retina, primarily in the inner plexiform layer and ganglion cells. A modest increase in staining for ETA receptors was also found in the outer plexiform layer in the retina of rats with IOP elevation. Cell culture studies showed that overexpression of ETA receptors in 661W cells as well as primary RGCs decreases cell viability, compared to empty vector transfected cells. Adeno-associated virus mediated overexpression of the ETA receptor produced an increase in the ETB receptor in primary RGCs. Elevated IOP results in an appreciable change in ETA receptor expression in the retina. Overexpression of the ETA receptor results in an overall decrease in cell viability, accompanied by an increase in ETB receptor levels, suggesting the involvement of both ETA and ETB receptors in mediating cell death. These findings raise possibilities for the development of ETA/ETB dual receptor antagonists as neuroprotective treatments for glaucomatous neuropathy. Glaucoma is a common optic neuropathy characterized by dysfunction and degeneration of retinal ganglion cell (RGC) axons, optic nerve head cupping, and loss of RGCs, ultimately resulting in irreversible vision loss. Primary open angle glaucoma (POAG) is one of the most common types of glaucoma and is a slowly developing neurodegenerative disease. Progressing without pain or overt symptoms, POAG can cause significant neurodegeneration of RGCs and their axons before any visual deficits are discernible. More than 2 million Americans and approximately 60 million people worldwide are currently affected by glaucoma and based on statistical estimates that number is expected to reach 3 million patients in America and almost 80 million worldwide by the year 2020 . Risk factors for developing glaucoma include age (over 60 years), myopia and race, with African-Americans being much more likely to develop POAG than Caucasians . From the point of view of therapy, the most readily detectable and treatable risk factor for POAG is an elevation in intraocular pressure (IOP). Currently surgical and pharmacological treatments for POAG are primarily aimed at lowering IOP which have been shown to delay the progression of POAG. Since it is possible to develop glaucomatous neuropathy without an increase in IOP and given that in some patients POAG may still progress after treatment, it is important to identify other possible etiological contributors and treatment options for POAG. One key contributor to the progression of glaucomatous optic neuropathy is the endothelin system of vasoactive peptides. Endothelins belong to a family of potent vasoactive peptides comprising of three isoforms: endothelin-1 (ET-1), endothelin-2 (ET-2), and endothelin-3 (ET-3) [3, 4]. The peptides act through two classes of G-protein coupled receptors: endothelin receptor A (ETA) and endothelin receptor B (ETB). Endothelins and their receptors have been shown to be present in multiple ocular tissues including the ciliary body, trabecular meshwork (TM) , retina [6, 7], and lamina cribrosa . Previous reports have shown that ET-1 levels are elevated in human patients with primary open angle glaucoma [9–11], as well as in the congenital beagle model of glaucoma . Endothelins have also been found to be elevated in the aqueous humor in the Morrison’s model of glaucoma  as well as in retinal microglia in the DBA/2J inherited model of glaucoma . Although endothelin levels are shown to be elevated during glaucoma, direct evidence for the contribution of endothelin to glaucomatous neurodegeneration can be best assessed using animal models of glaucoma. Studies have shown that administration of ET-1 can produce degeneration of RGC axons in multiple animal models [15–19] and induce apoptosis of RGCs in rats . A recent study in a mouse model showed activation of the endothelin system occurs early in glaucoma development before any observed morphological changes . Administration of bosentan, a dual endothelin receptor antagonist (that blocks both ETA and ETB receptors) in the diet (100 mg/kg), was found to promote neuroprotection . Previous studies from our laboratory demonstrated that following ocular hypertension, rats deficient in ETB receptors showed a significant reduction in RGC loss compared to that seen in wild type rats . However, the status of ETA receptors under conditions of ocular hypertension and their precise role in neurodegeneration is not completely understood. The current study was aimed at understanding changes in ETA receptor expression in the retinas of rats with elevated IOP. All animal procedures were carried out in accordance with the ARVO resolution for the Use of Animals in Ophthalmic and Vision Research. The protocol was approved by the Institutional Animal Care and Use Committee (IACUC) at the University of North Texas Health Science Center. For the current study, the Morrison’s model was used to induce ocular hypertension in adult male retired breeder Brown Norway rats as previously described . Briefly, intraocular pressure was raised in one eye (by injecting approximately 50 µL of hypertonic saline through episcleral veins), while the other eye served as the contralateral control. Animals were sedated by intraperitoneal injection (100 µL/100 g body wt) of an anesthesia cocktail containing 55.6 mg/mL Ketamine (VEDCO), 5.6 mg/mL Xylazine (VEDCO), and 11.1 mg/mL Acepromazine (Lloyd Laboratories). After sedating the animals a small incision was made in the conjunctiva to expose the episcleral veins. A 1.8 M NaCl solution was then injected into an episcleral vein using a glass needle (TIP01TW1F, WPI) at a rate of 309 µL/min for 10 s. IOP was measured 2–3 times a week using a TonoLab tonometer (iCare, Finland). Six pressure readings were averaged for each IOP measurement and ten IOP measurements were obtained for each eye. IOP plots were generated from IOP values obtained from the surgically treated eye and contralateral control eye. The IOP exposure in each rat was computed by the integral product of the extent of IOP elevation and the number of days for which it maintained (expressed as mmHg-days). Typically, we get IOP exposures of approximately 61 to 90 mm Hg-days for 2 weeks of IOP elevation and 98 to 140 mm Hg-days for 4 weeks of IOP elevation. Animals were sacrificed by intraperitoneal pentobarbital injection (120 mg/kg body wt) and then eyes were carefully enucleated. A small incision (approximately 4–5 mm) was made using an ophthalmic micro surgical knife (MVR 20G, 160710, Cambrian-Medical) just posterior to the limbus and the eye was fixed in 4% PFA for 30 min. After fixation for 30 min the incision was continued around the eye until the entire anterior segment, including the lens, was completely removed. The posterior segment was fixed in 4% PFA for an additional 2.5 h. Eyes were then washed and placed in 70% ethanol until paraffin embedding. Sagittal retinal sections through the optic nerve (10 μm) were obtained using a microtome. Following deparaffinization, sections were blocked for 1 h in 5% normal donkey serum containing 5% BSA in PBS at room temperature. Sections were incubated in primary antibody and subsequently incubated with the appropriate secondary antibodies for 1 h each at room temperature. To detect any background staining, blank sections were prepared using the same protocol; however no primary antibody was added (Additional file 1: Figure S1, Additional file 2: Figure S2). Primary antibodies used were rabbit anti-ETA (1:100, Sigma) and mouse anti-β-III-tubulin (1:500, Sigma). Secondary antibodies used were donkey anti-rabbit Alexa 647 (1:1000, Invitrogen) and donkey anti-mouse Alexa 488 (1:1000, Invitrogen). Sections were mounted and kept in Prolong® Gold antifade reagent with DAPI (P36931, Invitrogen). Images were taken using a Zeiss LSM 510 META confocal microscope. An integrated projection of confocal z-stacks was created for every image and the fluorescence intensity was measured using ImageJ software. The freehand region of interest (ROI) tool was used to outline the regions of the retina to be analyzed. Bright field images were used for selecting ROIs. Once selected, ROIs were added to the ROI manager and overlaid onto the red channel (ETA antibody) before measuring intensity. Values obtained for blank sections (no primary antibody) were averaged and served as background which was subtracted from the experimental values. After the background was subtracted, the measurements for each eye were averaged to obtain the mean fluorescence intensity. For each animal, the fluorescence intensity from contralateral (control) eyes were set to 1 to determine the relative change in ETA receptor expression between IOP elevated and contralateral eyes. To measure expression of ETA and ETB receptors in primary RGCs confocal z-stack projections were generated for each image. The bright field images were used to visualize cells and the freehand ROI tool was used to trace somas which showed co-staining for β-III-tubulin (red fluorescence). Each trace was added to the ROI manager and overlaid onto the pink channel (ETA and ETB receptors) before measuring fluorescence intensity. For most cell culture experiments, transformed 661W photoreceptor cells were used. The 661W cells were grown in DMEM/low glucose media (Thermo Scientific) containing 10% fetal bovine serum (F2442, Sigma), 100 units/mL penicillin and 100 µg/mL streptomycin (SV30010, GE Healthcare). Stable clones overexpressing the ETA receptor were generated by transfecting 661W cells with an ETA receptor cDNA plasmid construct using Lipofectamine 2000 (11668-019, Invitrogen) and applying selection pressure with Geneticin (G418, 300 µg/mL) for 4 weeks. Briefly, cells were transfected with either pCMV6-Empty vector or pCMV6-ETA expression vector (Origene, Rockville, MD) in DMEM serum-free media for 24 h and then placed in DMEM complete media for 24 h. Cells were dissociated by incubation in 0.0625% trypsin for 5 min at 37 °C and diluted to yield approximately 20 cells/mL and 100 µL of the cell suspension was added to multiple wells of a 96-well plate. Cells were then allowed to grow in DMEM complete media containing Geneticin (300 µg/mL) and were maintained for 4 weeks. Individual clones of 661W cells that displayed resistance to Geneticin were isolated, plated into separate wells of a 24-well plate and propagated further. Four stable clones were generated for both pCMV6-Empty and pCMV6-ETA receptor expression vectors. ETA receptor expression was confirmed by western blot and the clone yielding the highest level of ETA receptor expression was used for further experiments. Stable clones of 661W cells expressing either empty vector or the ETA receptor were counted using a hemocytometer and seeded in 24-well plates and grown to 50–60% confluence. Clones were treated with either DMEM serum-free media or DMEM serum-free media containing 100 nM ET-1 or ET-3 and allowed to incubate at 37 °C for 24 h. Following incubation, cells were washed twice using Dulbecco’s Phosphate Buffered Saline (DPBS) (#14278072, Gibco) and incubated with a Live/Dead assay kit (L3224, Life Technologies) for 30 min. Living cells were labeled green with Calcein AM and dead/dying cells were labeled red by Ethidium homodimer (EthD-1). Cell nuclei were labeled with a Hoechst stain to observe and obtain total cell numbers. Images were taken using a fluorescent microscope and cell counts were performed using ImageJ software (NIH, http://imagej.nih.gov/ij). MTT assays were performed using 661W cells stably overexpressing either the empty plasmid vector or ETA cDNA encoding plasmid. A hemocytometer was used to count the cells and approximately 2000 cells were seeded in a black-wall clear-bottom 96 well plate. The cells were allowed to grow overnight at 37 °C. Before treatment, cells were washed once in DMEM serum-free media. Empty vector and ETA vector expressing cells were then treated with 100 nM ET-1 or 100 nM ET-3 for 24 h. Following treatment, cells were washed once with DMEM serum-free media and then 20 μL of Promega CellTiter96 Aqueous One Solution was added to each well. The plate was incubated for 30 min and then the absorbance was measured at 490 nm for each well. Readings were taken using the Cytation5 (Bio-Tek). A standard curve was generated by measuring absorbance readings for wells seeded with 2000, 4000 and 8000 cells (Additional file 3: Figure S3). The standard curve was then used to extrapolate cell numbers from experimental absorbance readings. Stable clones overexpressing either the empty vector or the ETA plasmid vector were used to assess differences in cell cycle by flow cytometry. Approximately 200,000 cells were seeded for each 100 mm dish for both Empty and ETA expression vectors. Cells were allowed to reach 60% confluence and were treated with either 100 nM ET-1 or 100 nM ET-3 for 24 h in DMEM serum-free media. Untreated cells were also kept in DMEM serum-free media for 24 h. Following treatment, media was removed to collect any floating cells and spun down. Adherent cells were removed via trypsinization (0.0625%) for 5 min and spun down. The floating and adherent cell pellets were resuspended in 100 μL and 1 mL of PBS, respectively, and then combined. After adding the suspensions together 3.3 mL Ethanol was added to the cell suspension, mixed well, and stored overnight at −20 °C. The cells were spun down, resuspended in 500 μL PBS, and a cell count was performed. Approximately 500,000 cells were transferred to a flow cytometry tube (352058, BD Falcon) and the volume was made up to 500 μL with PBS. Cells were incubated with 2.5 μL of RNase A (20 mg/mL) for 30 min at 37 °C followed by 5 μL of propidium iodide (1 mg/mL) for 30 min at room temp. Cell cycle analysis was conducted using a Beckman Coulter Cytomics FC500 Flow Cytometry Analyzer. Stable clones overexpressing either the empty vector or the ETA receptor plasmid vector were grown to confluence on 100 mm dishes. Cells were harvested using ice cold PBS and spun down at 3300 rpm for 5 min at 4 °C. Pellets were resuspended in an isotonic buffer (20 mM HEPES; 1 mM EDTA; 0.25 M sucrose; 0.5 mM PMSF, 1 mM DTT; 1× Halt protease inhibitor (78430, Thermo Scientific); 100 mM NaF; 1 mM Na3VO4. Cells were lysed by sonication and spun down at 12,000×g for 5 min at 4 °C. The supernatant was collected and spun down at 100,000×g for 45 min at 4 °C. The resulting pellet was then resuspended using an isotonic detergent buffer (20 mM HEPES; 1 mM EDTA; 0.25 M sucrose; 0.5 mM PMSF; 1 mM DTT; 1× Halt protease inhibitor; 0.1% Igepal CA 630; 0.1% Triton-X-100). Protein concentration was determined using spectrophotometry and 10–20 μg of protein was used for western blot experiments. Primary antibodies used to probe blots were rabbit anti-ETA (1:1000; Sigma), rabbit anti-ETB (1:10,000, Antibody Research Corporation), rabbit anti-Calnexin (1:1000, Cell Signaling) and mouse calnexin (1:1000, Cell Signaling). Secondary antibodies used were donkey anti-Rabbit HRP (1:10,000, GE Healthcare) and sheep anti-Mouse HRP (1:10,000, GE Healthcare). Blots were developed using SuperSignal™ West Dura extended duration substrate (34,075, Thermo Scientific). Adeno-associated virus serotype 2 (AAV-2) encoding the ETA receptor was generated in the lab by inserting ETA cDNA (OriGene) into the AAV-2-IRES-hrGFP vector (Agilent Technologies, Santa Clara, CA). The restriction enzymes SalI-HF (New England Biolabs, Ipswich, MA) and XhoI (Promega, Madison, WI) were used to clone the ETA cDNA fragment into the AAV-2-IRES-hrGFP vector. The resulting AAV-2-ETA plasmid was sequenced (Lone Star Labs) to confirm the nucleotide sequence and ensure the cDNA was properly oriented. The AAV-2-IRES-hrGFP vector was used as control. The AAV-2-ETA virus and AAV-2-GFP (control) viruses were then generated using AAV Helper-Free System according to the manufacturer’s protocol. Viral titer was determined using QuickTiter™ AAV Quantitation Kit (Cell Biolabs, Inc). Retinal ganglion cells were isolated and purified as previously described . Briefly, RGCs were obtained from post-natal day 5 Sprague Dawley rat pups and purified by immunopanning. RGCs were positively selected for using the Thy1.1 antibody. Cells were seeded and grown in a 96-well plate (5000 cells/well) or 12-mm glass coverslips (30,000 cells/coverslip) and incubated in 10% CO2. RGCs were allowed to attach and produce neurites for 7 days prior to further experiments. The growth medium was changed every 3 days throughout the experiment. Primary RGCs were seeded and grown on 12-mm glass coverslips. Seven days after seeding, AAV-2-GFP and AAV-2-ETA was added to the cells and viral transduction was allowed to proceed for 11 days to permit robust expression of ETA receptors. The growth medium was removed and cells were fixed using 4% PFA. After fixation, a permeablization buffer (0.1% sodium citrate, 0.1% Triton-X-100 in PBS) was added to each well for 5 min. Cells were incubated in blocking buffer (5% normal donkey serum, 5% bovine serum albumin in PBS) for 1 h at room temperature. Primary antibodies were diluted in antibody dilution buffer (1% BSA in PBS) and RGCs were incubated overnight at 4 °C. Primary antibodies used were rabbit anti-ETA (1:100, Sigma), rabbit anti-ETB (1:500 Antibody Research Company), mouse anti-β-III-tubulin (1:500, Sigma). Secondary antibodies were diluted in antibody dilution buffer and cells were incubated for 1 h at room temperature. Secondary antibodies used were donkey anti-rabbit Alexa 546 and donkey anti-mouse Alexa 647. Coverslips were mounted on slides using Prolong® Gold antifade reagent with DAPI (P36931, Invitrogen). Images were taken with the Zeiss 510 Meta confocal microscope. Our laboratory has previously demonstrated that the endothelin receptor B (ETB) is upregulated following an increase in IOP and contributes to the degeneration of RGCs . The focus of the present study was to determine if similar changes in the ETA receptor expression was observed after IOP elevation. Following 2 weeks of IOP elevation in Brown Norway rats, retinas obtained from both IOP elevated and contralateral control eyes showed immunoreactivity for ETA receptors in multiple retinal layers including the nerve fiber layer (NFL), ganglion cell layer (GCL), inner plexiform layer (IPL), and outer plexiform layer (OPL) (Fig. 1b). Compared to the contralateral controls, a qualitative analysis of retinas obtained from IOP elevated eyes showed an increasing trend in ETA receptor expression within the OPL, IPL and GCL. Expression of ETA receptors was colocalized with RGCs using β-III-tubulin which is a selective neuronal marker (Fig. 1b). Additionally, a modest increase in immunostaining for ETA receptors was also observed in the NFL compared to the contralateral controls. A semi-quantitative analysis measuring the change in fluorescence intensity was also performed using ImageJ software. Projections from confocal image z-stacks were analyzed for relative fluorescence intensity of ETA receptor expression in IOP elevated eyes and corresponding contralateral control eyes to determine fold change. While five out seven rats showed an increase in immunostaining for the ETA receptors, two of the seven rats showed a slight decrease, thereby did not attain statistical significance at the 2 week time point of IOP elevation (retina, RFI = 1.57 ± 0.34; OPL, RFI = 1.40 ± 0.28; IPL, RFI = 1.51 ± 0.33; GCs, RFI = 2.40 ± 0.98; NFL, RFI = 1.54 ± 0.46), however there was a clear trend towards an increase in immunostaining for ETA receptors (Fig. 1c). Similar to the pattern of expression observed at 2 weeks of IOP elevation, increased immunoreactivity for ETA receptor in the retina was also observed in the NFL, GCL, IPL, and OPL (Fig. 2b). Retinas obtained from Brown Norway rats following 4 weeks of IOP elevation qualitatively showed the greatest increase in immunoreactivity for ETA receptors in the IPL and GCL. A faint increase in ETA receptor expression was also observed in the NFL and OPL. A semi-quantitative analysis was performed which indicated a statistically significant increase in ETA receptor expression overall in the retina (RFI = 1.37 ± 0.04, n = 4, p < 0.001) as well as in the IPL (RFI = 1.35 ± 0.14, n = 4, p < 0.05) and GCs (RFI = 1.59 ± 0.16, n = 4, p < 0.01) following 4 weeks of IOP elevation (Fig. 2c). Statistical significance was not reached in either the OPL (RFI = 1.43 ± 0.23) or the NFL (RFI = 1.38 ± 0.30) however the same trend of increased ETA receptor expression was still present. Taken together, the data suggest that ETA receptor expression was upregulated due to ocular hypertension in rats and that the increase in ETA receptor expression was sustained during longer durations of IOP elevation. In order to elucidate the role of ETA receptor in the retina and its possible contribution to neurodegeneration, stable clones were generated by transfecting 661W photoreceptor cells with either an ETA receptor cDNA vector or the corresponding empty plasmid vector. A live/dead assay using Calcein AM and Ethidium homodimer-1 (EthD-1) was performed with the stable ETA receptor clone and the empty vector clone following a 24 h treatment with either 100 nM ET-1 or ET-3. Cells were also labeled using Hoechst nuclear stain for visualization and quantitation of total cell numbers (Fig. 3a). Analysis of EthD-1+ cells (dead/dying cells, red fluorescence) in empty vector transfected group revealed no change in the percentage of dead/dying cells following treatment with either 100 nM ET-1 (1.22 ± 0.15%) or ET-3 (1.33 ± 0.17%) compared to untreated cells (1.44 ± 0.25%) (Fig. 3b). Stable clones overexpressing the ETA receptor, regardless of treatment group, showed an increase in the percentage of dead/dying cells when compared to empty vector clones. There was no further exacerbation of cell death in ETA vector expressing cells (2.28 ± 0.22%) following treatment of either 100 nM ET-1 (2.39 ± 0.23%) or ET-3 (2.30 ± 0.24%) (Fig. 3b). In addition to quantifying the percentage of dead/dying cells, Calcein AM+ cells (living, green fluorescence) were also analyzed. No decrease in the percentage of living cells was observed in empty vector cells (98.77 ± 0.18%) following 24 h treatment with either 100 nM ET-1 (98.03 ± 0.21%) or 100 nM ET-3 (97.85 ± 0.21%) (Fig. 3c). The percentage of living ETA receptor overexpressing cells (98.33 ± 0.22%) was reduced after treatment with ET-1 (97.37 ± 0.21%, n = 3, p < 0.05) but not with ET-3 (97.69 ± 0.24%) (Fig. 3c). Using Hoechst staining to quantify total cells in each treatment group, we consistently found a lesser number of total cells in wells containing ETA overexpressing cells (811.89 ± 48.56) compared to empty vector cells (1013.94 ± 72.91) (Fig. 3d). Total cell number was further reduced in empty vector cells after treatment with either ET-1 (639.83 ± 48.75, n = 3, p < 0.001) or ET-3 (655.12 ± 76.45, n = 3, p < 0.001). Cell numbers for the ETA vector transfected group were further decreased following ET-1 treatment (613.42 ± 60.37) and reached statistical significance in the ET-3 treatment group (508.94 ± 52.50, n = 3, p < 0.01) (Fig. 3d). To clarify the above findings, an additional cell viability/proliferation assay was performed. To confirm that ETA overexpression compromises cell viability, an MTT (3-(4,5-dimethylthiazol-2-yl)-2,5-diphenyltetrazolium bromide) cell proliferation assay was performed on empty vector and ETA cDNA overexpressing 661W cells. Absorbance readings at 490 nm were taken for each well of a 96-well plate. Empty vector transfected cells treated with 100 nM ET-1 (Abs = 0.310 ± 0.014) or 100 nM ET-3 (Abs = 0.289 ± 0.023) for 24 h showed a decreasing trend in absorbance readings compared to untreated empty vector cells (Abs = 0.328 ± 0.019) though not statistically significant (Fig. 4a). Absorbance readings for cells overexpressing the ETA receptor (Abs = 0.289 ± 0.015) did not show a significant decrease compared to empty vector cells. The greatest reduction in absorbance was observed in ETA vector cells treated with 100 nM ET-3 (Abs = 0.235 ± 0.020) for 24 h, however, no change was detected after treatment with ET-1 (Abs = 0.298 ± 0.013), compared to the untreated ETA receptor transfected cells (Fig. 4a). 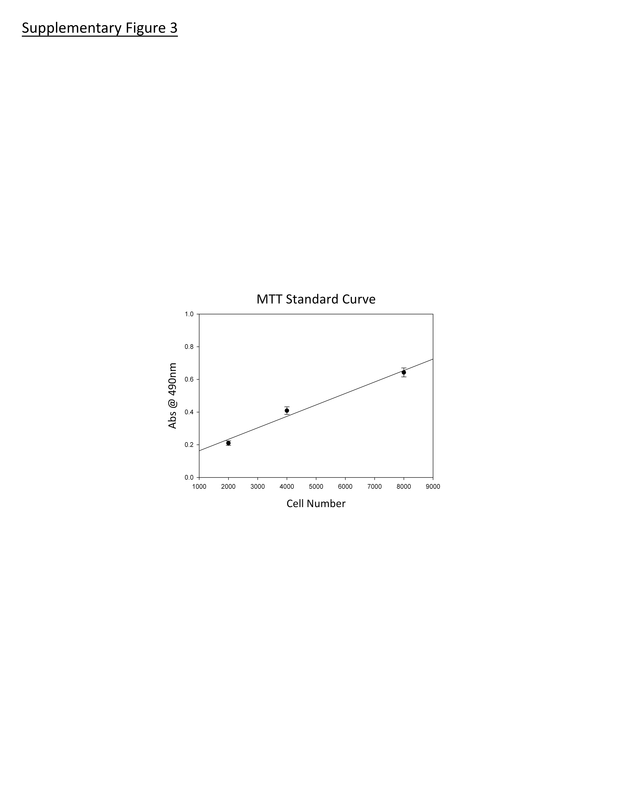 A standard curve generated from absorbance readings from known cell numbers was used to extrapolate the number of cells in the experimental groups (Fig. 4b). These results are in line with the live/dead assay and which shows a decrease in cell viability for cells overexpressing the ETA receptor. Interestingly in both assays, the increase in cell death was most prominent following treatment with ET-3, an ETB receptor agonist. After demonstrating that ETA receptor overexpression affected cell viability in the 661W stable clone, we wanted to further explore the effect of ETA receptor overexpression on the cell cycle. Fluorescence-Assisted Cell Sorting (FACS) analysis using propidium iodide (PI) was utilized to observe if there were alterations in certain phases of the cell cycle between empty vector and ETA receptor overexpressing cells. Analysis of the histogram plots revealed differences in the G0/G1 phase peak (arrowheads) and the Sub G phase peak (arrows) between empty vector and ETA receptor vector cells (Fig. 5a). No difference was found in the G2M and S phases for empty or ETA receptor vector cells (Fig. 5b). There was no change in the G0/G1 peak for empty vector cells after treatment with either 100 nM ET-1 or ET-3 (empty: 61.96 ± 2.04%; empty ET-1: 64.23 ± 1.27%; empty ET-3: 63.41 ± 1.46%) or in ETA vector cells following treatment (ETA: 55.90 ± 0.62%; ETA ET-1: 55.12 ± 1.52%; ETA ET-3: 56.75 ± 2.27%) (Fig. 5c). Statistical significance was reached in G0/G1 phase between empty vector ET-1 treated cells versus ETA vector ET-1 treated cells (64.23 ± 1.27 vs. 55.12 ± 1.52%, n = 3, p < 0.05) and empty vector ET-1 treated cells versus ETA vector cells (64.23 ± 1.27 vs. 56.75 ± 2.27%, n = 3, p < 0.05). A significant difference was also seen in empty vector ET-3 treated cells versus ETA vector ET-1 treated cells (63.41 ± 1.46 vs. 55.12 ± 1.52%, n = 3, p < 0.05) (Fig. 5c). Assessment of the Sub G peak also showed no difference between empty vector cells following ET-1 or ET-3 treatment (empty: 4.96 ± 0.57%; empty ET-1: 4.11 ± 0.93%; empty ET-3: 5.07 ± 0.84%) or between ETA vector cells following treatment (ETA: 10.20 ± 1.42%; ETA ET-1: 11.09 ± 1.23%; ETA ET-3: 9.47 ± 1.46%) (Fig. 5d). There was a trend towards an increase of the SubG peak in ETA vector cells compared to empty vector cells although it did not reach statistical significance (10.20 ± 1.42 vs. 4.96 ± 0.57%, n = 3). Significance was reached however between ETA vector ET-1 treated cells and empty vector cells (11.09 ± 1.23 vs. 4.96 ± 0.57%, n = 3, p < 0.05). A difference was also observed between empty vector ET-1 treated cells and ETA vector cells (4.11 ± 0.93 vs. 10.20 ± 1.42%, n = 3, p < 0.05) as well as ETA vector ET-1 treated cells (4.11 ± 0.93 vs. 11.09 ± 1.23%, n = 3, p < 0.05). Empty vector cells treated with ET-3 also showed a significant difference from ETA vector ET-1 treated cells (5.07 ± 0.84 vs. 11.09 ± 1.23%, n = 3, p < 0.05) (Fig. 5d). Considering that the ET-3 peptide is selective for the ETB receptor and has low affinity for the ETA receptor it was interesting to see decreased cell viability in ETA receptor overexpressing cells treated with ET-3 (Figs. 3, 4). To explain how ETA receptor overexpressing cells treated with the ET-3 peptide showed a reduction in total cell numbers in both the live/dead assay and the MTT assay, we wanted to know if there were changes in the expression of ETB receptors. To determine this, we performed an immunoblot analysis to determine changes in ETB receptor expression in cells overexpressing ETA receptors. ETB receptor expression was found to be variable in cells overexpressing the ETA receptor. In some samples ETB expression was relatively unchanged while in other samples there was an almost twofold increase in expression. Overall, there was an increasing trend in ETB receptor levels in 661W cells stably overexpressing the ETA receptor (Fig. 6). Since the above data was collected from the 661W cell line, we wanted to determine if ETA receptor overexpression showed the same increase in cell death of primary RGCs. To determine this, primary RGCs were transduced with either the AAV-2-GFP or AAV-2-ETA virus and subsequently treated with ET-1 (100 nM) or ET-3 (100 nM). Cell viability was determined by treating for 30 min with the NUCLEAR-ID® Blue/Red cell viability reagent (Enzo Life Sciences). Cell death of RGCs transduced with AAV-2-GFP vector without endothelin treatment was 18.66 ± 0.03% (Fig. 7). Following 24 h treatment with 100 nM ET-1 or 100 nM ET-3, cell death of AAV-2-GFP transduced RGCs was increased to 42.69 ± 0.11 and 75.45 ± 0.10% (p < 0.0001), respectively. RGCs transduced with the AAV-2-ETA vector showed significantly greater cell death, 53.86 ± 0.06% (p < 0.05), compared to AAV-2-GFP transduced RGCs. Unlike AAV-2-GFP transduced RGCs, no exacerbation of cell death was observed in AAV-2-ETA transduced RGCs after 24 h treatment with either 100 nM ET-1 (60.57 ± 0.08%) or 100 nM ET-3 (57.53 ± 0.03%). Similar to that observed in 661W cells, total RGC numbers were decreased following treatment with ET-1 or ET-3 and in RGCs transduced with AAV2-ETA. Primary RGCs transduced with the AAV-2-ETA virus showed a 2.1 fold increase in ETA receptor expression (p < 0.001) compared to cell transduced with the AAV-2-GFP virus (Fig. 8c). Immunostaining for the ETB receptor revealed a 4.4 fold increase in ETB receptor expression (p < 0.001) after transduction with AAV-2-ETA compared to AAV-2-GFP (Fig. 8d) . 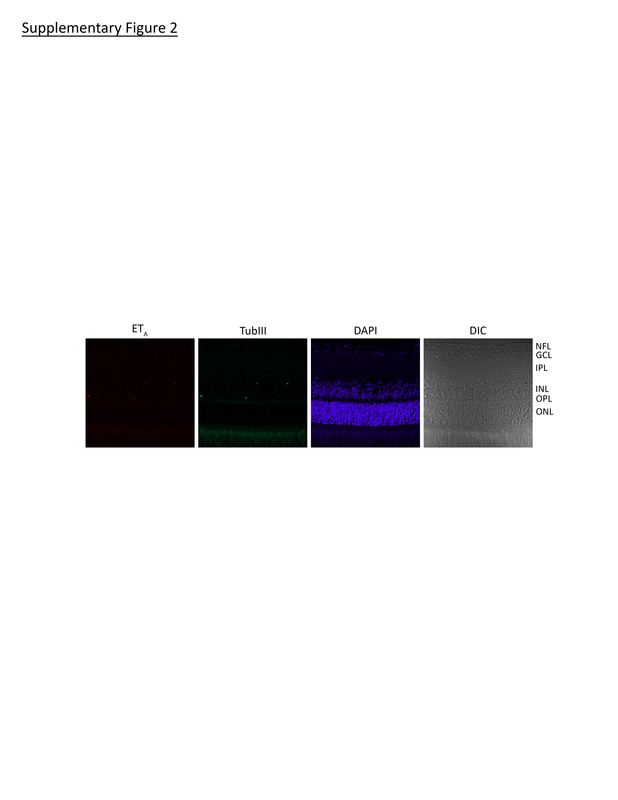 The endothelin system has been established to have a neurodegenerative role in animal models of primary open angle glaucoma. Most of the focus in the literature has been on the ETB receptor, with previous studies from our lab demonstrating that the ETB receptor is a major contributor to glaucomatous neurodegeneration . Although there has been very few studies focusing on the ETA receptor in glaucoma, some reports have alluded to a possible role for the ETA receptor in neurodegeneration. Many reports indicate that one of the earliest site of damage during glaucoma is in the axons of RGCs at the optic nerve head suggestive of an axonopathy. Studies assessing axonal transport in the optic nerve following ET-1 administration found a decrease in the transport of mitochondrial subcomponents  and a disruption of the transport and delivery of fast axonal transport cargos . At the optic nerve head ET-1 induces an increase in ETB receptors in optic nerve head astrocytes  and induces proliferation of astrocytes; however the proliferative antagonist was blocked using either an ETA or ETB antagonist  as well as the ETA/ETB dual antagonist. These studies suggest that the endothelin peptides have the ability to induce neurodegenerative effects by numerous cellular mechanisms involving both ETA and ETB receptors. Howell et al. found an increase in mRNA expression of both ETA and ETB receptors at an early stage of disease progression in the DBA/2J mouse model of glaucoma. In addition, our lab has shown that ETA mRNA levels are also increased in the retina following IOP elevation in Brown Norway rats . Furthermore, recent studies have shown significant neuroprotection using a dual endothelin antagonist [14, 28]. These findings suggest that in addition to the ETB receptor, the ETA receptor could also play a role in glaucomatous neurodegeneration; however the precise role of the ETA receptor is largely unknown. In this study we have demonstrated for the first time, by immunohistochemistry. that there is an increase in ETA receptor expression in multiple layers of the retina following 2- and 4 weeks of IOP elevation, compared to the corresponding contralateral control eyes in Brown Norway rats. We further demonstrated by multiple in vitro techniques that ETA receptor overexpression leads to an overall decrease in cell viability of both 661W cells and primary RGCs. The cell death observed in 661W cells was minimal, possibly due to confounding effects of the cell line which is inherently proliferative, thereby attenuating the cell death inducing effect of endothelins. The ability of endothelins to promote cell death was clearly evident in the primary RGCs which do not proliferate since they are terminally differentiated. While ETA overexpression in primary RGCs produced increased cell death, there was no further exacerbation of cell death after treatment of these cells with ET-1 and ET-3. This suggests that there was a threshold of endothelin receptor activation following ETA receptor overexpression, possibly due to autocrine effects mediated by endothelin release from RGCs. In 661W cells stably overexpressing the ETA receptor, we observed a greater reduction in cell viability when treated with ET-3 than when treated with ET-1 Considering that ET-3 is an ETB agonist which has low affinity for the ETA receptor, it was more likely that cell death was occurring due to ETA receptor mediated upregulation of the ETB receptor. To support this conclusion we performed an immunoblot analysis of 661W cells stably overexpressing ETA receptors and found an increasing trend in ETB receptors expression (not significant), compared to empty vector cells. In primary RGCs, immunostaining revealed AAV-2 mediated overexpression of the ETA receptor produced a greater than fourfold increase in ETB receptor expression. In support of these findings, He et al. showed that treatment of RGCs with either ET-1 or ET-3 produced an increase in both ETA and ETB receptor proteins detected by immunocytochemistry. Our findings, in this study and in conjunction with previous studies, have provided evidence that both ETA and ETB receptors are upregulated due to an elevation in IOP in Brown Norway rats. It is generally accepted that the ETB receptor is the major contributor to cell death of RGCs , however based upon our current findings, the involvement of the ETA receptor in the upregulation of ETB receptors, thereby contributing to cell death, is a plausible scenario (Figs. 6, 8). In animal models of traumatic brain injury an ETA receptor antagonist showed the ability to limit neuronal damage . Pretreatment with BQ-123, an ETA receptor antagonist significantly reduced axonal injury and improved retention of cognitive scores . While the cellular and molecular mechanisms involved in neuroprotection in the brain and the retina might not be exactly the same, the greater neuroprotective effects of dual endothelin receptor antagonists, compared to ETB receptor selective inhibitors alone, suggests the involvement of both receptors in neurodegeneration. While it is evident that the endothelin receptors are upregulated during IOP elevation, some questions still need to be addressed in the future. One such question is how does an increase in IOP lead to elevated endothelin levels and increased endothelin receptor expression? The second question that still remains to be answered is what pathways are involved during endothelin receptor mediated neurodegeneration? One study showed that when shear stress is applied to endothelial cells there is an increase in ETB receptors, c-jun, and AP-1  and a study using a rodent model of glaucoma also showed involvement of AP-1 and C/EBPβ in the upregulation of ETB receptors , although the mechanotransduction pathways have not been fully elucidated. Interestingly, following treatment of RGCs with either ET-1 or ET-3 we found an increase in both c-Jun and phospho-c-Jun suggesting that the JNK/c-Jun pathway may be a contributor to endothelin receptor upregulation and endothelin-mediated cell death of RGCs. Assessment of the contribution of both endothelin receptors to glaucomatous neurodegeneration provides a good rationale for developing endothelin antagonists as neuroprotective agents for the treatment of glaucoma. NRM participated in ocular hypertension surgeries and IOP measurements, carried out all immunohistological and cellular biology experiments, analyzed data and drafted the manuscript. AZM helped perform ocular hypertension surgeries and IOP measurements. DLS, SH and NRM performed RGC isolations. Cell counts were made by HBJ. RRK performed ocular hypertension surgeries, conceived and aided in the design and coordination of the study, and helped to draft the manuscript. All authors read and approved the final manuscript. The authors thank Dr. Thomas Yorio for several useful discussions and feedback on this project. The authors thank Dr. Muayyad Al-Ubaidi (University of Houston) for the kind gift of the 661W photoreceptor cell line. The authors thank Dr. Xiangle Sun, Flow Cytometry and Laser Capture Microdissection Core Facility, UNT Health Science Center, for assistance with FACS analysis reported in this publication. All data, reagents and recombinant viruses reported in this study will be available to other investigators through applicable rules via a Material Transfer Agreement from the University of North Texas Health Science Center. Ethics approval and consent to participate All studies reported in this manuscript were in the accordance with the guidelines of the Association for Research in Vision and Ophthalmology (ARVO) for the use of animals in research and approved by the Institution Animal Care and Use Committee (IACUC) at the University of North Texas Health Science Center (Protocol No. 2013/14-44-A05). This work was supported by an extramural Grant to RRK from the National Eye Institute (EY019952) and from an intramural Grant from the UNT Health Science Center (RI6191). The first author, Mr. Nolan McGrady, was supported by a NIH training Grant (T32 AG 020494) awarded to the Neurobiology of Ageing training program. 12868_2017_346_MOESM1_ESM.png Additional file 1: Figure S1. Immunostaining negative control for 2 week IOP elevated retina sections. No primary antibody for endothelin A (ETA) receptor or β-III-tubulin (TubIII) was added. DIC image show retinal layers. 12868_2017_346_MOESM2_ESM.png Additional file 2: Figure S2. Immunostaining negative control for 4 week IOP elevated retina sections. No primary antibody for endothelin A (ETA) receptor or β-III-tubulin (TubIII) was added. DIC image show retinal layers. 12868_2017_346_MOESM3_ESM.png Additional file 3: Figure S3. Standard curve generated from the averaged absorbance readings at 490 nm of two-thousand, four thousand and eight thousand 661W cells. Points represent average absorbance ± SEM at each cell density (n = 20).